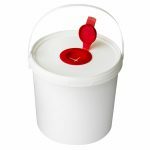 H&O manufactures and sells white wet wipe containers to retailers and other non-domestic UK customers. Purchase directly from the manufacturer to get the best possible prices on wholesale orders over 50 units. 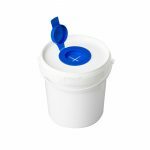 These containers are designed to be used one-handed for a variety of wiping and cleaning tasks. White and hygienic, the dispenser is fitted with a colour coded plastic insert to keep towels from drying out when not in use. For commercial orders over 500 units please call: 0151 639 0002 for the largest possible discount on your order.